We were asked to rebrand an existing company that provides a comprehensive manufacturing service for composite products in advanced engineering applications that includes components for aircraft structures and aircraft systems. They wanted their new brand to reflect their credentials that the company upholds as well as having a website that looks good and will appeal to their customers. 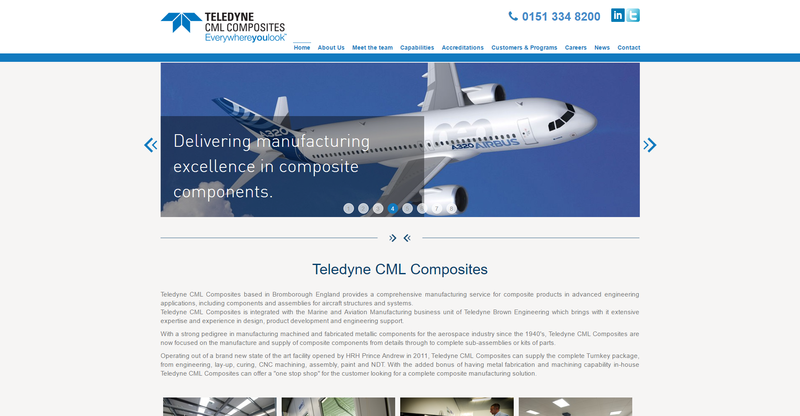 Teledyne CML requested a website their clients and potential clients can visit to look into what they do and how they do it. The website needed to highlight the vast capabilities and numerous accreditations the company has. A requirement of the website was to showcase the large customers and programs they have worked with such as BAE systems, Spirit Aerosystems and Marland. A clean corporate feel that encompassed simplicity and ease of use was the outcome. The striking blue in the Teledyne CML logo was used to give colour to the website and keep the branding universal throughout.